Emily Leayman confirms an Old Town Alexandria gym ended the membership of white nationalist Richard Spencer after he was confronted over his racial views. C. Christine Fair, an associate professor at Georgetown University’s School of Foreign Service, recognized and approached Spencer at Old Town Sport&Health on Wednesday. Fair said Spencer called for help from one of the trainers, who happened to be African-American. She added that a white woman who claimed to not know who Spencer was asked Fair to stop making a scene. Two days after the encounter, Fair tweeted out a picture of the encounter and a response to the gym ending Spencer’s membership. Spencer confirmed to Buzzfeed with a copy of the gym’s termination letter. He said he initially denied his identity to Fair because he didn’t want to get into a confrontation. “I don’t come to the gym to do politics. But she started screeching and yelling all this stuff,” he told Buzzfeed, adding that other gym goers had asked her to stop. He said that the manager told Fair to stop and asked her to leave after around 10 minutes. Spencer advocates for white supremacy in the Old Town Alexandria-based National Policy Institute. The encounter comes after Spencer joined white supremacist groups in Charlottesville to protest the city’s decision to remove a Robert E. Lee statue from a public park. Spencer, who joined the Alexandria gym in February, has not indicated whether he will take action against the gym. This actually could go either way legally. The woman created the initial disturbance as Spencer was keeping to himself. I’m sure the gym contract says something like “we reserve the right to terminate membership at any time at our discretion” so as long as they don’t discriminate against a protected class (which Nazis aren’t), they can terminate whoever they want. Furthermore, this is mostly-liberal Alexandria. If the gym sides with him, think about the backlash by the press, social media, word-of-mouth, etc. A boycott eventually what would’ve happened. When it gets to that point, it’s not about the woman anymore. The disturbance is because of who he is, a Nazi. I’m gonna guess the gym had no idea who he was before this. This was a business decision. For his defenders, if you are really quiet and listen closely, you can hear the world’s tiniest violin playing the world’s saddest song for a man who advocates for peaceful ethnic cleansing. 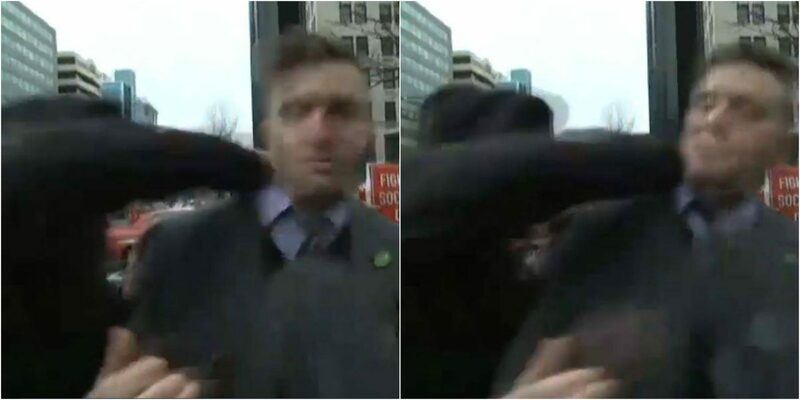 Richard Spencer and Nazis deserve no quarter here, there, or anywhere.